Modular Storage vs. Static Industrial Shelving: which works for you? Which works best for your warehousing or industrial application? A matter of function...what are you storing, how much room do you have...is security an issue? Is appearance vital? When trying to decide what method works best for your application, look first to what's being stored. If you're using lots of boxes and bins on shelving, aisle after aisle of it, then your storage area is a good candidate for modular drawer storage - either cabinets or drawer/shelf combinations. If most of what you store is open-shelf, the cost of modularization probably isn't going to be justifiable unless other facts (security, space availability, etc) come into play. Even if you're splitting the kinds of storage, some modularization is worthwhile if it consolidates the stored product into an easily-accessible, organized modular area while leaving the rest on open shelves. Shelving is far less expensive than modular storage. The claim from modular manufacturers is that their cabinets can replace about 5 shelving units with bins. Modular cabinets run from $1,300 on up. However, the cost of operation, space, walk time, security and other factors must be taken into account. Modular storage is the clear winner if space is the prime factor. Shelving is inherently larger, less concentrated storage - almost to the point of wasteful. Modular storage systems provide the highest density storage available. Shelving upper levels and the rear of shelves are hard to see and reach, and often wind up unused, using up space and making picks harder to execute. Most estimates put the space savings at about 70 percent. If space isn't a factor, shelving or a mixed approach can be effective. 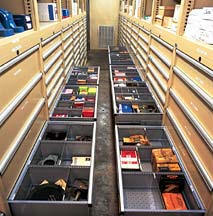 Full extension modular drawers allow easy access and full use of the furthest corner of each drawer. On the flip side, a shelf with bins allows a picker to remove the bin and place it on a workstation for even easier use. Shelving allows bin placement in the "golden zone" between waist and chin. If a worker attempts to pick from a bin on shelves without taking the bin out, it's sometimes difficult to reach into the back of a stored bin. Flexibility is where modular storage clearly edges shelving. It's easy to move a drawer cabinet - much easier than it is to disassemble and reassemble rows of shelving and bins. You can add cabinets, or even add modular drawers to your shelving. Not a contest. Modular storage is lockable and shelving isn't. Modular units can also be attached to the ground, making it difficult to take the entire cabinet. It's difficult to argue that shelving can be made to look attractive, even with good housekeeping and organizational practices. There is no hint of untidiness with a modular storage system. 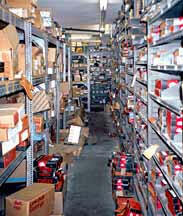 Shelving provides no protection from dust and dirt. When you boil it down, it's all about application and use. While modular storage offers many advantages, it's clearly more expensive than shelving. In the right application, you will find use for both types of storage, or a mixture of them. Need help with your application? Call or send this form! Do you need to attach a drawing, photo, or file?